Start the new year with a freshly organized workstation. 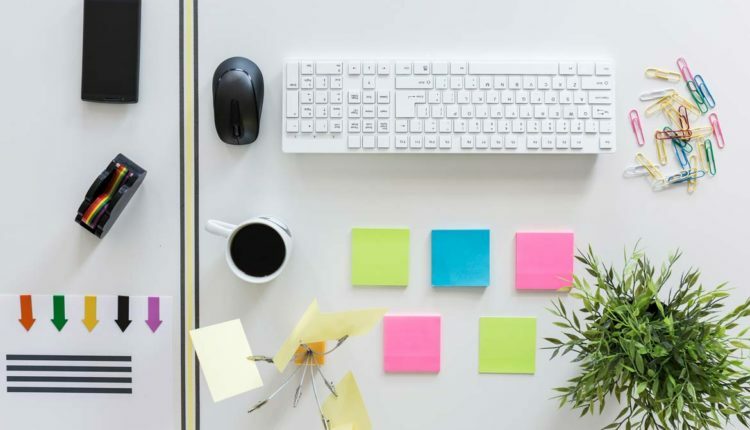 Creating a designated home for each of your office supplies will create a less chaotic work environment. You’ll be able to focus your attention on work rather than searching for files. Spend your 40+ hour work week surrounded by personal and professional items that inspire you. Start by clearing off your desk completely, sorting through clutter and creating a filing system for regular disposal of outdated materials. From there, use the following tips to create a workspace that cultivates a productive work day. Start by clearing off your workspace completely. Use this time to disinfect all of your surfaces and electronics. It’s the perfect opportunity to clean all of those hard to reach crevices that are often ignored the rest of the year. Sort through all of the paper and trinkets that have collected in your workspace over the past year. Organize the items you need to keep in a file folder or magazine organizer. Create a system for disposing of outdated files on a regular basis. Keep everything you need during the day within arm’s reach. Pens, sticky notes, on-going projects and monitors are all heavily used office tools. Accessibility is key to a productive, uninterrupted work flow. Make sure you keep an open spot for incoming documents or any pen and paper work you may have to complete. In addition, open desk space can keep you feeling calm and productive. Use drawer and desk organizers to give all of your small work supplies a home. Designating a spot for all items makes it easier to access supplies and reorganize throughout the day. A few personal photos, plants and decorations can inspire and keep you going throughout the day. However, too many personal items just become clutter. Physical clutter can take up space in your brain, causing you to be distracted and overwhelmed. Free up desk space with hanging organizers or drawers. Any supplies that are needed but not used every day can be stored above your desk or in a drawer. This method allows your supplies to be nearby but not taking up visual space or valuable desk space. For physical and digital projects alike, create a filing system to organize ongoing, completed and future files. Once a habit is formed, you won’t even have to think about where to find the next file. It’ll be muscle memory. At ServiceMaster Twin Cities in Little Rock Arkansas, our focus is reliable, high-quality janitorial services for your commercial property. We’ve been making local businesses shine for almost 30 years. With that experience in mind, you can expect us to exceed your expectations and get the job done right! Our services include floor care, office system cleaning, window washing and more. Contact us for a free commercial cleaning quote.